In September 1990, US, British and other forces were mobilising in the Gulf following the Iraqi invasion of Kuwait and full scale war was imminent. At Conway Hall in London's Red Lion Square a meeting was held on Sunday 2 September "to organise a plan of action... to counteract the blatant warmongering and racism that is going on". The meeting was called by Hackney Solidarity Group, who had invited members from all the class struggle anarchist and anti-state communist groups in London. Those represented at the meeting included Class War, the Anarchist Communist Federation, the Direct Action Movement, the Anarchist Workers Group, Wildcat, Sussex Poll Tax Resisters and Haringey Unwaged Centre as well as various individuals. 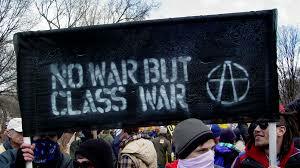 With the exception of the AWG who argued for a support to Iraq (and later dissolved with leading members joining the Revolutionary Communist Party), all those present agreed to oppose the war on a position of revolutionary opposition to all sides in the conflict and to set up regular meetings using the name "No War but the Class War" (NWBTCW). The row with the AWG at least gave people there a strong sense of what they were not. They were not anti-imperialists or pacifists. Deciding what we were FOR, and, in particular, what kind of practical activity on our part we were for, was a different matter. Most of the groups who set up NWBTCW did not consistently work together. They used common slogans and marched as a bloc on demos but they did not all attend meetings or pool resources. The most useful contribution from this scene came after the end of the war and after NWBTCW dissolved. NWBTCW meetings did involve revolutionaries from the Middle East living in London, who in turn had links to comrades in Iraq, Iran and elsewhere. As a result, people who had been involved in NWBTCW were able to distribute some of the first reliable information in English about the uprisings in Iraq at the end of the war, demonstrating that these were revolutionary working class movements rather than Kurdish nationalist or Shi'ite revolts. The name NWBTCW was revived for a similar group at the time of the Kosovo conflict in 1999. A few of the same people were involved but this time there was less political consistency and it was conceived very much as a discussion forum with meetings being "open" (i.e. widely advertised) from the beginning. As before many of the people in the group participated in demos as a bloc and a rather fine banner was made saying "No War but the Class War" (or rough equivalent) in English, Serbo-Croat and Albanian. There was, however, a great deal of disagreement as to whether it was worth going on the "anti-war" demos at all. They were even more politically dubious than most so-called anti-war demos - in addition to the usual anti-imperialisst Trots (some of which were pro-Serbia, some of which wanted to arm the Albanian nationalist KLA) and middle class "starve them, don't bomb them" pacifists, there were quite a few Serb nationalists, some of whom were brandishing Second World War vintage Serb nationalist flags proclaiming "God, King, Country"! Many participants in NWBTCW felt that it was better to just hand out leaflets criticising the demos rather than actually go on them. After the bombing and the demos stopped a few people from this group organised some discussion meetings on the subject of revolutionary opposition to war. Now, in response to the US and Britain's almost immediate resort to war in response to September 11, a new "NWBTCW" group has been set up in London. We hope to carry on in the basic spirit of the previous versions of this group - opposition to all sides in the war and support for resistance against them across the world on the clear basis that the working class has no country. As always, no doubt, the same issues will come up. How do we avoid the twin pitfalls of being a passive "talking shop" on the one hand, and mindless activism on the other? How do we relate to the "official anti-war movement" and its demos (often addressed by MPs and other blatant enemies of the working class)? How do we connect with a class struggle which is very weak at the present time (at least across most of the planet)? Does anyone know if the post-2001 NWBTCW group got anywhere, or just died off quickly? I suspect I kind of know the answer, but it'd be good to get a fuller account.